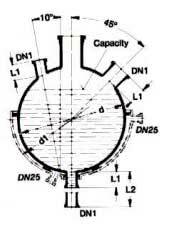 Note: Although spherical vessels of 5 and 10 liters capacity can generally be supported by their top neck all other spherical vessels should be supported from below in a heating or cooling bath, heating mantle or using one of the vessel supports listed on these pages. They can be used under full vacuum. The table above shows the maximum working pressure which we recommend for each size.